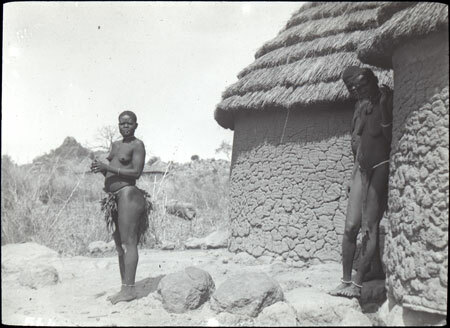 A women wearing ring lip ornament and leaves at the waist front and back, standing near a hut with two other women looking curiously around it. Although given a duplicate number in the Shilluk images, it is possible that these aren't Shilluk women. Note on lantern slide - "V.b.5. Sudan. Shilluk type(?) Duplicate No. CGS." Morton, Chris. "(? )Shilluk women" Southern Sudan Project (in development). 03 Jan. 2006. Pitt Rivers Museum. <http://southernsudan.prm.ox.ac.uk/details/1967.26.23/>.